The past couple months have been an exercise in realizing that I have an obvious, glaring hole in my life skill set. I'm sure we've all been confronted with this from time to time, but when it's something core to your business, it can be a real awakening. I have many blind spots. I freely admit it. There are things I will never be good at - things I just can't see how to get from here to there. Dancing is one of those things. Even at the worst wedding, with the cheesiest music, and the biggest crowd, I stick out like a sore thumb. I take the idea of having "two left feet" to the next level. Size 14 feet can cause all kinds of carnage on the dance floor, which is probably one (of many) reasons why I was never the "clubbing" type. I've come to terms with the fact that I am not and will never be a good dancer. But my dancing hasn't been a limitation I've been struggling with of late. My biggest blind spot is design. I'm not an artist. I am amazed at the vision and performance of people who are really good at what they do - it's like magic. Listening to a piano virtuoso (I took piano lessons as a kid for 10 years and barely got past Moonlight Sonata), watching an artist paint (I took an art class in high school, and the teacher just took pity on my inability to put anything recognizable on paper), or seeing ballet dancers drift and float across a stage all strike me as incredible, impossible acts by people with brains wired totally different than mine. For the past several years, as we have been building GreenRope, I have known there was something missing in our user interface. I wracked my brain, trying to get from "here" (a system built functionally that did everything we wanted it to do) to "there" (the same capability but with a modern, streamlined, non-intimidating user experience). The part that I couldn't see was the design. I knew it had to better, but I couldn't see how. So I took a leap of faith and hired an agency. The agency, Fairway Technologies based in La Jolla, specializes in UI design, and they have done an amazing job. Looking back at the last several weeks, I can't believe what we were able to accomplish. Our charts and graphs have been modernized to a new look using a company called HighCharts. The graphics and text layouts on the dashboard have been updated. The filters on the Contacts page have been redesigned. New icons are in place all over GreenRope using a relatively new method of adding them as fonts. And we took steps to speed up parts of the system, including the calendar. All of these improvements were possible because of collaboration. The agency filled our blind spot with a vision of where we should go. Fairway Technologies was able to identify our blind spot and fill it with a vision for GreenRope—one I could not have found on my own. I had heard users occasionally say parts of our system weren't "intuitive". Hearing that is the most frustrating thing ever. There's nothing to go on. It doesn't say "here is a problem, and this is exactly how I want it fixed". It says, "I'm not sure what's wrong, but I don't like it." As a logical, problem-solving engineer mind, it would drive me crazy. How can I fix an unbounded, ambiguous problem? We had to call in people who could think like users and could use a fresh set of eyes to see how to define the issues and point us in the right direction. In coming up with our new design, we had to put ourselves in our users' shoes and break problems down into small pieces. 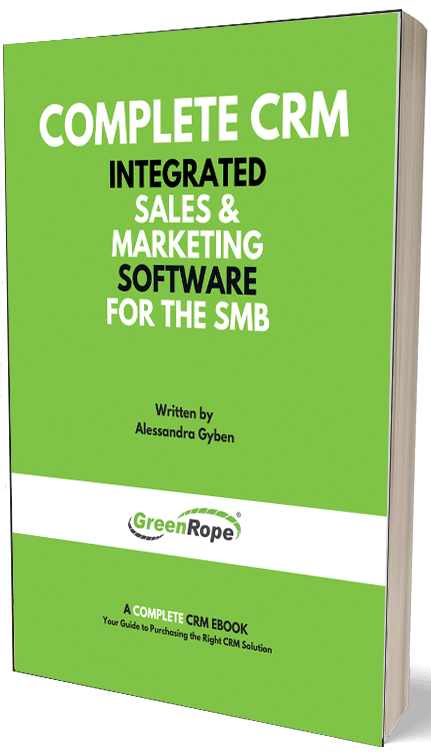 What do marketers and sales managers use GreenRope to do? What features are used most often? How can we streamline the workflow? How do we make it run faster? No matter how much quantitative measuring you do, there is an artistic answer to all of these. Not everyone who uses our software uses it the same way, and not all of our users are cut from the same cloth. GreenRope users are men and women, fresh out of college and seasoned veterans, sales professionals and marketing experts, in 20 countries. We needed a facelift that would appeal universally to those demographics, and our team of engineering-focused developers wasn't going to get it. We had a collective blind spot. I've heard that the mark of a good CEO is one who knows when to say "no", and from my experience, this is one of the great truths of leadership. There are always people requesting things - partner with our company, build that feature, invest in this technology, let us invest in you, etc etc. Trying to figure out what to do with the limited resources on hand is the challenge every business owner faces. The "gamble" on an investment in design paid off, in my opinion. Our software now has a feel to it that is much different than just a couple months ago. Spending resources on an agency to find and address our blind spot was the best decision I could have made at this point in our business lifetime. I encourage you to take some time to think about what your blind spots are. Where do you feel like you need improvement, but don't know how to get where you want to go? Think about who can help you get there, and approach them with an open mind. I hope this inspires you to take that chance, and that that chance works out to help you and your business or personal life.